Is There A Good Reason To Doubt ESPN's Sean Miller Report? 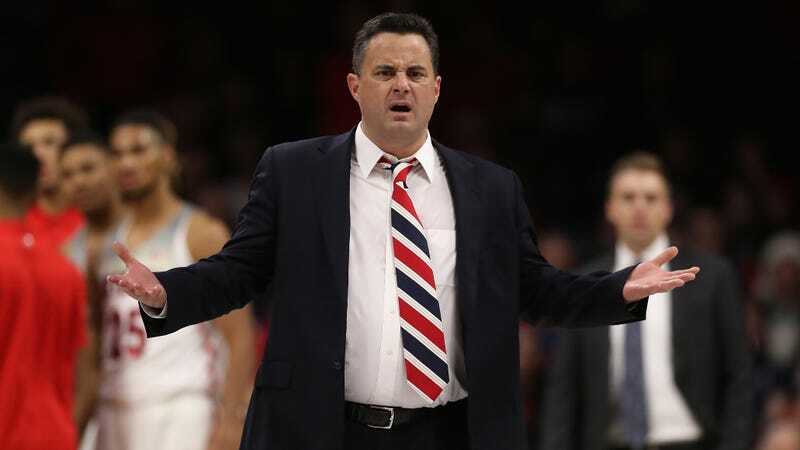 Last Friday, ESPN published a big piece by Mark Schlabach that revealed the FBI had recorded phone conversations between Arizona head coach Sean Miller and sports agency runner Christian Dawkins in which they devised a pay-for-play scheme. Schlabach reported that, specifically, the FBI wiretaps caught multiple calls between to two in which they agreed to pay DeAndre Ayton $100,000 to play for the Wildcats. The report said that during one call “Miller told Dawkins he should deal directly with him when it came to money.” The piece also laid out the ways in which Dawkins worked as a runner for ASM Sports Group, an agency headed by Andy Miller that has since had its records seized by the FBI. It also stated that the call between Miller and Dawkins was reportedly among the 3,000 hours worth of wiretapped calls the FBI is reviewing as part of its investigation into college sports. After folks had some time to digest ESPN’s report over the weekend, though, some people started posing some questions. The questions started coming from where they usually do, fan boards and Reddit threads, and eventually began popping up on Twitter and in the mouth of an actual reporter. The most valid question anyone’s raised so far concerns the specific date of the alleged call between Miller and Dawkins. On Feb. 24, Schlabach said in a TV talkback on ESPN that the specific call about the $100,000 payment was made in 2017. In a Feb. 24 SportsCenter talkback, ESPN used the wrong year in discussing the timeline in a story about telephone conversations between Arizona coach Sean Miller and Christian Dawkins, a key figure in the FBI’s investigation into college basketball corruption. Sources told ESPN the call in question was made in 2016. By that time, Ayton was already on the team at Arizona, as he committed to the Wildcats in September 2016 and signed in November; he began orientation on June 19, the day the wiretapping is supposed to have started, according to 24/7's sources. If this was the only period in which Miller’s and former Arizona assistant Emmanuel Richardson’s phone calls with Dawkins were recorded, it would mean that 1) Ayton had not yet been paid by the time he arrived on campus or 2) ESPN’s timeline is off by at least half a year. This tweet, along with him saying in his TV appearance that he was “told” about the call by his source, implies that he did not personally review the call or a transcript of the Miller call—note that the initial ESPN report contained no quotes from Miller’s part in the phone call, but stated only that the call took place and summarized what was said. The tweet also means he’s almost certainly relying on a source that is either a defendant or working on the defendant’s team, the notable part being his source is not the FBI. In the time since Schlabach’s tweet, there has been plenty of eyebrow-raising from the Very Online Fans, but also from at least one member of the national college sports media. The issue with the ESPN report isn’t whether an Arizona coach helped facilitate Ayton being paid the significant amount of money he deserves for his services—Book Richardson almost certainly did, though 24/7's sources doubt the price tag of $100,000, which is a shame because it means Ayton, one of the best players in the game, got short-changed. The issue is two-fold: First, Sean Miller’s involvement and current job status depend on a report that cites a source but no transcript or audio evidence. And second, the timeline of the phone call does indeed seem to be in a gray area, based on 24/7's reporting. ESPN has since doubled-down, telling 24/7 on Monday they stand by their timeline placing the call in the spring of 2016. Of course, the call could have been made and tapped in the spring of 2016 and been included in FBI efforts outside of the date range that 24/7 reported, which means this would largely be folks blowing up over Schlabach going on TV and saying “2017” when he meant to say “2016.” Still, if you’re going to report on an NCAA violation because of the price tag and the big-name coach involved, it’s probably best to cover all your bases and not provide the gibbering loons who make up college fanbases even the smallest bit of ammunition.